The Lakers are talking to coaching candidates this week after dismissing Luke Walton on Friday. (Walton had a new job — the best job available, actually, if you don’t count the Lakers gig — by Saturday.) Rob Pelinka, Magic Johnson’s general manager before Magic Johnson ditched the Lakers for Twitter, is leading the search. 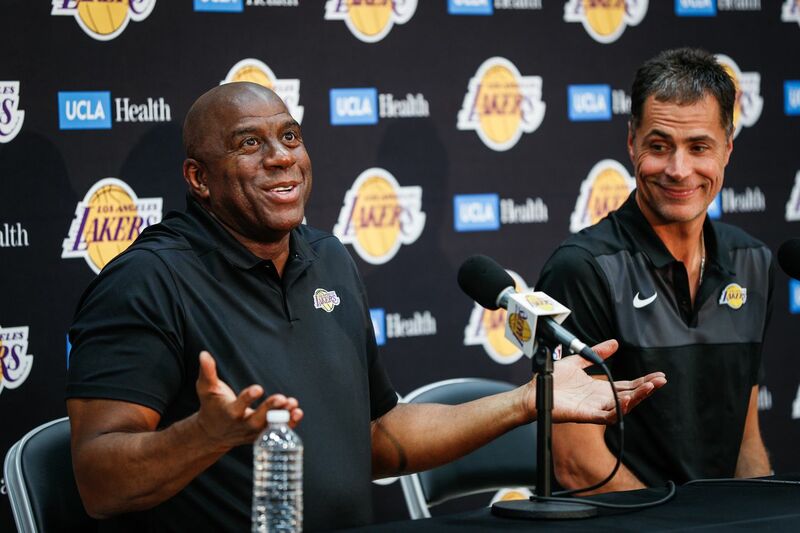 According to reports, Pelinka has gained power in the vacuum left by Magic’s hasty exit. However, the Lakers have not named Pelinka the new president of basketball operations. He is still being listed as the general manager. That would indicate that at some point, Pelinka will have a new boss. That would be wise: Pelinka’s only front-office experience is the past two years working with Magic, which is to say that Pelinka’s only front-office experience was an absolute mess. Prior to that, he was a player agent — most notably, Kobe Bryant’s player agent. Prior to that, he was a sixth wheel on the Fab Five teams. I’m not sure anyone in the world is prepared to properly handle the incredibly difficult task that faces the next leader of the Lakers’ front office. The roster has a bunch of young players who could be great or could be untradeable, some cap space, and also LeBron James. James is entering Year 2 of a four-year deal, might be hitting the twilight of his basketball career, and tends to be rather finicky with his coaches. He’s also still one of the five best players on the planet, and maybe more. This would be a tough job for the absolute fittest. Does anyone believe Pelinka is the fittest? Rob Pelinka might not even believe that. At some point, the Lakers are either going to decide that Pelinka is the right person for the job right now and elevate him, or the Lakers — this means Jeanie Buss — will decide to hire someone to either oversee Pelinka or replace him. Elevating Pelinka at such a critical time, given his experience (both the lack of it and what we’ve seen over the past two years), would seem like a huge unforced error. If the Lakers aren’t going to do that, letting Pelinka hire a new coach seems like a huge unforced error. You have to let the leader of the front office make the final call on a new coach given how important the coach will be to the future of the LeBron-led Lakers and that team’s quest to end an embarrassing, franchise-record playoff drought. If letting Pelinka lead the coaching search leads to Pelinka becoming the leader of the front office, that’d bad. If Pelinka and Buss hire a coach and then go hire somewhere to oversee Pelinka, that coach is going to start in a precarious position from Day 1. The Lakers surely understand that part of the problem that led to Walton’s ouster was that he was never Pelinka and Magic’s coach. He was already there when Magic and Pelinka replaced Jim Buss and Mitch Kupchak. The new front office stuck with him for two more years, but it became clear this season that no one was on the same page. Why are the Lakers intent on either reliving that drama, or putting Pelinka in a further position of authority without even seeing who else is out there? This is the LAKERS. They could legitimately poach a top front office candidate from a good team, if they only tried. But doing this coach search backwards — rushing to commit to a Ty Lue, or a Monty Williams, or a Juwan Howard — is going to turn off any candidate who might be considering making the leap (hello, Bob Myers) and might eventually have Buss resigned to elevating Pelinka. When you do things that look dysfunctional, you ensure you’ll remain dysfunctional by turning off capable people who could be your salvation. This may seem melodramatic, that doing this coaching search before the front office pecking order is settled is the doom of the near-term future of the franchise. But it could be. It’s certainly not normal. The Lakers tried “not normal” two years ago with the Magic-Pelinka pairing, and we see where that left the franchise: on vacation for the first weekend of the NBA playoffs. Maybe acting like a normal, capable NBA team would be a nice change of pace for once. It’s worth a try.